Lithuanian Table Bread. Photo by Thomas Schauer. Zachary Golper, chef/owner of Brooklyn bakery Bien Cuit, along food writer Peter Kaminsky, taste-tested their way through New York City while researching the cookbook Bien Cuit: The Art of Bread. They were kind enough to share the recipe for Lithuanian table bread, a subtle and slightly sweet loaf with a dense crumb. One of the last outposts of a once rock-solid Polish enclave on the border of Sunset Park and Park Slope is Jubilat Provisions, a hall of fame of kielbasa and cold cuts. They also sell out-of-the-ordinary pickled vegetables, like pickled parsley root, which really completes a sandwich. 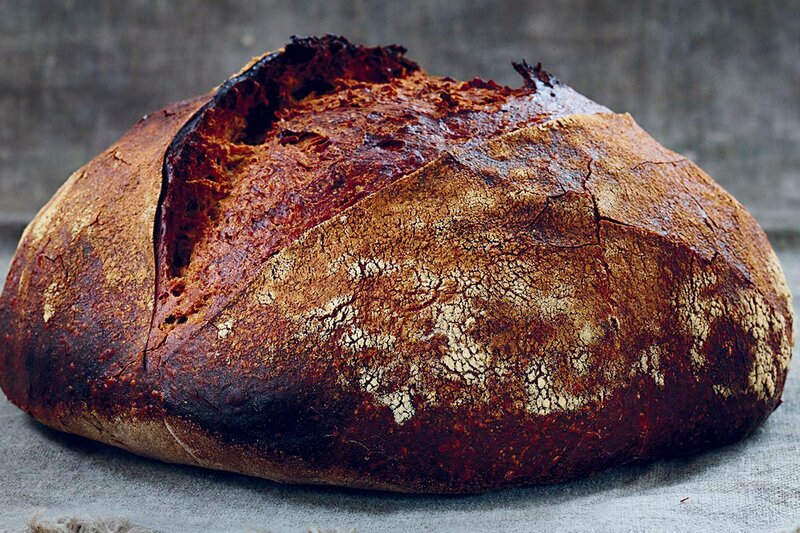 Their Lithuanian rye inspired an unexpected but rewarding bread quest that resulted in our Lithuanian table bread recipe. Dusting mixture (combine one part fine semolina flour with five parts white flour) for the lined proofing basket and the shaped loaf. 1. Put the sourdough starter in a medium storage container and add water. 2. Break the starter into pieces with your fingers until it's almost dissolved in the water; there will still be some small pieces. 3. Stir in the flour until fully incorporated. 4. Cover the container and let sit at room temperature for 10-16 hours. The starter will be at its peak at around 13 hours. 1. Stir together the white and white rye flours, salt, and yeast in a medium bowl. the container. Transfer the starter and water to an extra large bowl along with the remaining water and the rye malt extract. Using a wooden spoon, break the starter up to distribute it in the liquid. The extract will not break up easily and will be stringy and a bit clumped together at this point. 3. Add the flour mixture, reserving about one-sixth of it along the edge of the bowl. Continue to mix with the spoon until most of the dry ingredients have been combined with the starter mixture. Switch to a plastic bowl scraper and continue to mix until incorporated. At this point the dough will be slightly sticky to the touch. and tuck the dough, adding the reserved flour mixture and a small amount of additional flour to the bowl and your hands as needed. Continue rolling and tucking until the dough feels stronger and begins to resist any further rolling, about ten times. Then, with cupped hands, tuck the sides under toward the center. Place the dough, seam-side down, in a clean bowl, cover the top of the bowl with a clean kitchen towel, and let rest at room temperature for 45 minutes. 5. For the first stretch and fold, lightly dust the work surface and your hands with flour. Using the plastic bowl scraper, release the dough from the bowl and set it, seam-side down, on the work surface. Gently stretch it into a roughly rectangular shape. Fold the dough in thirds from top to bottom and then from left to right. With cupped hands, tuck the sides under toward the center. Place the dough in the bowl, seam-side down, cover the bowl with the towel, and let rest for 45 minutes. 6. For the second stretch and fold, repeat the steps for the first stretch and fold, then return the dough to the bowl, cover with the towel, and let rest for 45 minutes. 7. For the third and final stretch and fold, once again repeat the steps for the first stretch and fold, then return the dough to the bowl, cover with the towel, and let rest for 20 minutes. 8. Line a nine-inch (23 cm) proofing basket or bowl with a clean kitchen towel and dust the towel fairly generously with the dusting mixture. 9. Lightly dust the work surface and your hands with flour and shape the dough into a round. Dust the sides and top of the dough with the dusting mixture, fold the edges of the towel over the top, and transfer to the refrigerator to chill for 20 to 28 hours. 10. Position an oven rack in the lower third of the oven. Place a covered 6-quart (5.7 L), 10-inch (25 cm) round cast-iron Dutch oven on the rack. Preheat the oven to 500°F (260°C). Remove the basket of dough from the refrigerator and let it sit at room temperature while you allow the oven to preheat for about one hour. 11. Using heavy-duty oven mitts or potholders, remove the Dutch oven, place it on a heatproof surface, and remove the lid. 12. Using the kitchen towel, lift and gently ease the dough out of the basket and onto a baking peel, seam-side down. Then carefully transfer it into the pot (the Dutch oven will be very hot). Score the top of the dough, cover the pot, and return it to the oven. Lower the oven temperature to 460°F (240°C) and bake for 30 minutes. 13. Rotate the Dutch oven and remove the lid. The loaf will already be a rich golden brown. Continue baking, uncovered, until the surface is a deep, rich brown, with some spots along the score being even slightly darker, about fifteen minutes longer. 14. Loosen the edges of the loaf with a long handled spoon and then with the help of the spoon lift out of the pot onto a cooling rack. When the bottom of the loaf is tapped, it should sound hollow. If not, return it to the oven and bake directly on the rack for five minutes longer. 15. Let the bread cool completely before slicing and eating, at least four hours but preferably twelve to thirty-six hours. 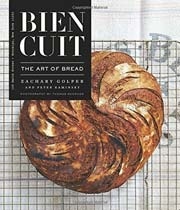 Buy Bien Cuit: The Art of Bread, by Zachary Golper and Peter Kaminsky. Reprinted with permission from Bien Cuit: The Art of Bread, by Zachary Golper and Peter Kaminsky, published by Reagan Arts, 2015. Zachary is the chef and owner of Brooklyn bakery Bien Cuit and Peter is a food writer and cookbook author. You can follow them on Twitter at @peterkaminsky and @zacharygolper and on Instagram at @biencuitnyc. Peter travels for the food and fishing (it's his idea of fun) and Zachary travels for the experiences that enrich his life with an understanding of cultures, food, and farming.